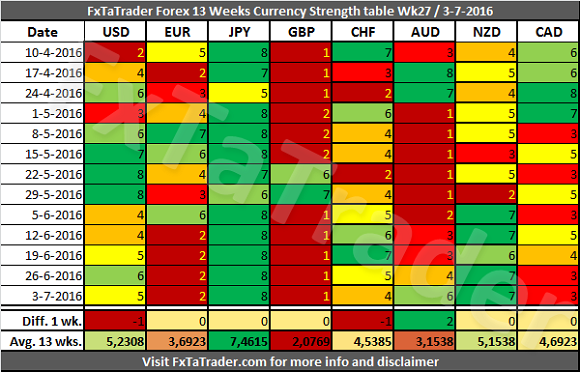 As can be see in the "Currency Strength Table" here above the EUR, being an average currency, has lost strength lately. In the last 4 weeks it had a score of just 2, which is a value for a weak currency in that period. This moves the 13 weeks average down to a value of 3,6923 curently. This value is far from the other average currencies, the CHF and the CAD. It is at the same time a value close to the AUD which is a weak currency. The EUR was up to this week 7 times stronger in the last 13 weeks compared to the AUD and that is just 7 out of 13. The EUR may become a weak currency if the weakness continues in the coming period. 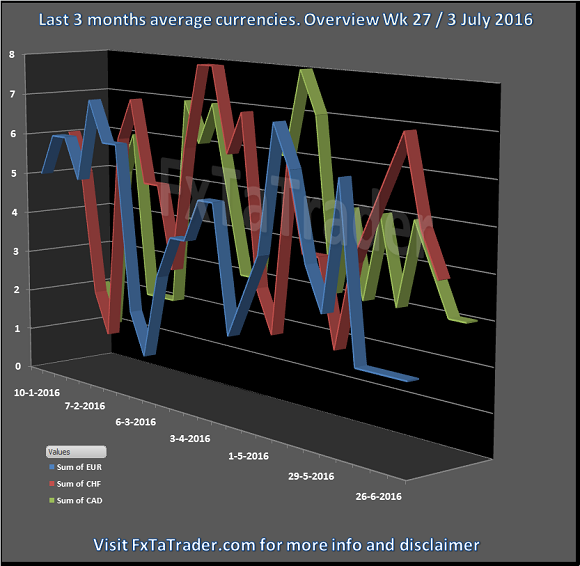 Here below you can see the average currencies and how the EUR is clearly getting weaker compared to the other average currencies. GBP/JPY, GBP/USD, GBP,NZD, EUR/JPY, GBP/CHF, GBP/AUD, GBP/CAD, CAD/JPY, CHF/JPY, EUR/NZD, AUD/JPY, EUR/GBP, NZD/CAD, and the EUR/USD. 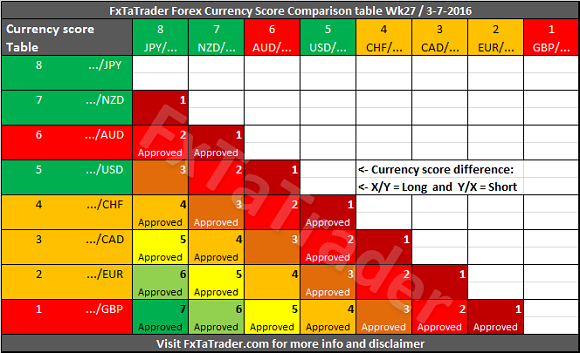 The AUD/JPY, EUR/GBP, NZD/CAD, and the EUR/USD are not mentioned in the Top 10 of the Ranking and Rating list.